Donald Pleasance and Peter Cushing do their best to get out of this maze. 1976’s Land of the Minotaur comes from Crown International Pictures, one of the more prolific names in the world of grindhouse, exploitation, and drive-in fare that dominated much of the sixties and seventies. I’ve become a pretty big fan of the studio and distributor, but I’ll be the first to admit that their catalog of titles is a really mixed bag. Some of their stuff works really well, but a lot of the movies made or released by the company fall short of their potential. Such is the case of Land of the Minotaur. 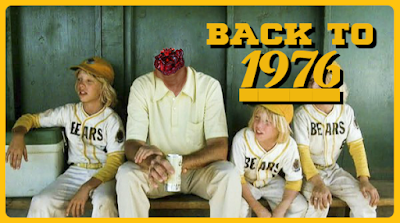 Because this was the mid-seventies, the horror in this movie is religious and occult based. Apparently that’s pretty much what 86 percent of horror movies were about between the years of 1970 and 1978, before a Mr. Myers was unleashed upon the world. 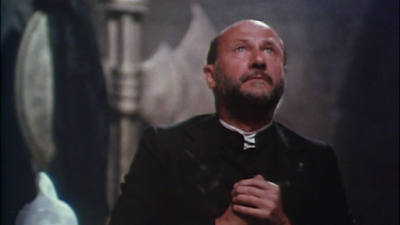 Donald Pleasance plays a priest (just like in Prince of Darkness) living in Greece and squaring off against a group of Satanists led by Peter Cushing. Well, to be truthful, they aren’t full-on Satanists. See, these guys worship the Minotaur, the monster of Greek myth who was half man and half bull and lived in a maze called the Labyrinth. The pagans in this movie are all about respect for the old gods, but they also believe that the Minotaur was just another name for the devil, so…okay, I guess they are devil worshipers. The Minotaur itself is actually really cool; it’s a statue, but the big, stone, anatomically-correct behemoth breathes fire and IT TALKS! We meet three young people who appear to be in their early twenties and are members of Donald Pleasance’s church. I only knew one of the actors from the trio: Luan Peters from Hammer’s Twins of Evil, here wearing some of the shortest shorts I’ve ever seen. The three go off exploring some Greek ruins, and eventually discover something they shouldn’t have seen. Before you know it, the cult of the Minotaur has kidnapped them and plans to sacrifice them to their god. When they turn up missing, Donald Pleasance recruits a private investigator, played by a Greek actor named Kostas Karagiorgis. Together, the two set off to find the missing kids. What they encounter is an entire town—including the police department—that seems to be keeping a very big secret from the outside world. The cult of the Minotaur is led by Peter Cushing, playing a character called Baron Corofax. At this point in his career (just one year before Star Wars) the actor was even thinner than in most of his Hammer horror work, looking like a skeleton with skin stretched over the bones. He preens and grimaces with unveiled menace, doing what Peter Cushing does, which is pretty much just looking pissed off in a very polite, English way. When he’s dressed in red robes for the sacrifices, Cushing appears quite capable of murder, despite appearing as if a strong breeze might blow him over. Even the completely-CGI Peter Cushing form Star Wars: Rogue One seemed threatening, and that wasn’t really even him. The movie doesn’t sound that bad, right? Seems like a fun, cheap exploitation horror with some solid acting because of Pleasance and Cushing, doesn’t it? Unfortunately, this is what happens when you have a great idea for a movie and you cast some talented leads, but don’t have a solid script or competent direction. The screenplay is full of holes, and actually not much really happens. Donald Pleasance goes to find the young people. He argues with some people in the town and there’s a scene that looks like an homage to Sergio Leone’s The Good, The Bad, and The Ugly. Then, just when you think the final confrontation is near, there’s another twenty minutes. It doesn’t help that there appear to be scenes missing from the movie. We make leaps from one scene to another with no explanation. For instance, a character goes down into the cave of the Minotaur. We see her walking down some stairs, and then the very next shot is her standing inside a room back in town. Total non sequitur. It happens multiple times; as a viewer, it’s hard to keep up. I don’t actually think any footage is missing (I see the same complaint from others). No, I think this movie is just poorly shot and edited by people who didn’t really know what they were doing. I also continue to struggle with wanting to like Donald Pleasance more than I do. On the Prince of Darkness podcast, I brought up an episode of Columbo that I still think is his best work. I suppose I prefer him as a nebbish, ineffective man who finds himself in over his head and must then come to terms with his circumstances. There’s an innate puppy-dog quality to the actor, a slight pitifulness that I can’t quite put my finger on but that tends to lend him sympathy. I find him to be a lot less effective when he takes matters into his own hands, which is what most scripts require of him. I know that part of the appeal of the actor is seeing an “everyman” play against type and rise to action, but I think he works better as someone who struggles internally rather than physically. In the Halloween series, he increasingly becomes a hunter. In Prince of Darkness, he seeks action. And here, in Land of the Minotaur, he once again chases down the evil itself, like a small, balding Rambo, only if Rambo rode in the passenger seat. Production is all over the place with this movie. I think most of the dialogue is either ADR or even voice replacement in some cases, but that’s not altogether uncommon for European movies of this generation. Because this actually filmed in Greece, the director (a Greek guy I’ve never heard of) manages to wring value out of the scenery itself, giving us some visuals that go above and beyond what’s expected for something this cheap. We don’t get to see a ton of it, but the Greek ruins provide atmosphere and even an ominous sense of foreboding. Also, I have to doff my cap to the explosive (literally) finale that had me laughing out loud. You know what? I’m going to describe the climax, because I have to talk about it. If you don’t want to know what happens at the end of the movie, skip to the next paragraph. Don’t worry, it will probably make you want to see this more, not less. 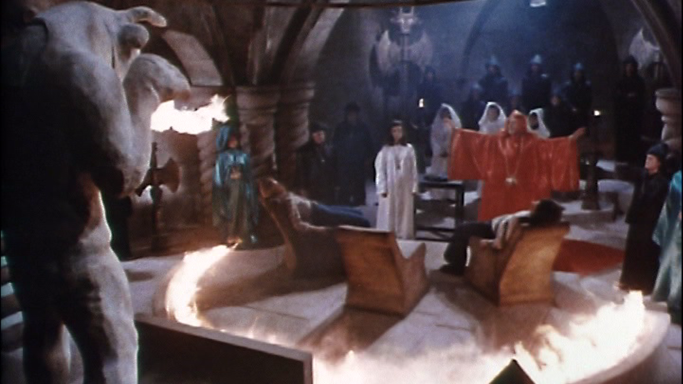 So at the end of the movie, Pleasance stumbles into this sacrificial chamber where TWO of the THREE young people from his church have already been killed, including Luan Peters and her shorts. He was too late! 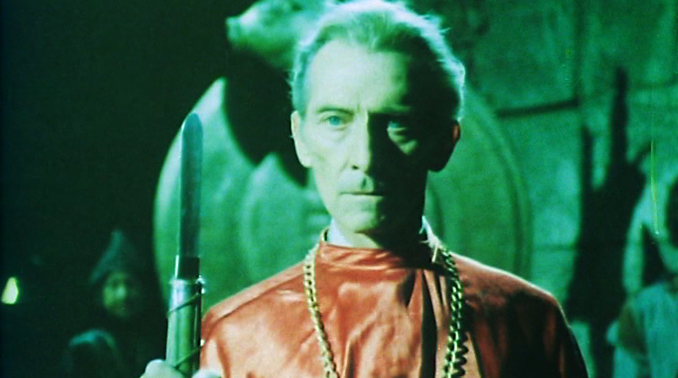 All these cultists are standing around in red and black silk robes, including a smug Cushing. Pleasance starts chanting something in Latin, and the cultists actually explode, one by one, into chunky little red pieces. It’s INSANE, and it’s the best part of the movie. They must have spent all of their budget on exploding people. The music for the movie is notable, at least in theory if not in execution. There’s a song in the movie that Paul Williams performs, and the score is provided by Brian Eno. I think it’s fair to call Eno a big deal in the music industry, as he’s an accomplished ambient musician in his own right. Eno is also the producer behind albums by David Bowie, The Talking Heads, Devo, and U2. There aren’t really any noticeable themes in this soundtrack (or much of anything you can pick out, really), but then again, that’s kind of what Eno does. “Huuuummmmmmm……Buuuuuuuuduuuuuuuuuuummmmm……” NAILED IT. As so often seems to be the case with movies of this genre and caliber, it’s hard to sum up my feelings on Land of the Minotaur. It’s not good. Who am I kidding, it’s really bad. But then again, I wouldn’t be writing about it or presenting it to you if I didn’t think that there was something about it that was interesting. That would be a waste of time. So what is it about this movie? Maybe it’s the presence of Donald Pleasance and Peter Cushing, two talented actors at different stages in their careers who were both about to experience renewed mainstream success in the next 24 months. Maybe it’s the fact that this is part of the death rattle of occult horror, soon to be overtaken by slashers and unstoppable monsters. Maybe it’s that creepy stone Minotaur that breathes fire, or the explosive finale. Maybe it’s that I can’t help but root for the underdog, and boy is this dog under. Maybe it’s just because I’ve become such a big fan of cult and exploitation movies and their ability to make something out of nothing without any aid from a studio or endless stacks of cash. Actually, I suspect that it’s probably the fact that so often these movies fall short of what they could have and should have been, but in interesting ways. When good talent and the kernel of a great idea collide with bad execution, it’s like watching a compelling little car accident that you can’t stop thinking about, long after it’s all over and the cops have cleared the area. This, my friends, is Land of the Minotaur.